The U.S. Green Building Council's LEED® Rating Systems are used as the basis for many of these sustainable design requirements. LEED is the predominant framework for implementing sustainable design in commercial and institutional buildings in North America. For projects pursuing LEED certification, or that wish to track their performance against LEED, the specifications include details on how LEED's requirements relate to the expressed requirements. One example of going green in La Selva that will help protect our natural park aesthetically, yet practically will be the use of "green roofs," or "green walls." 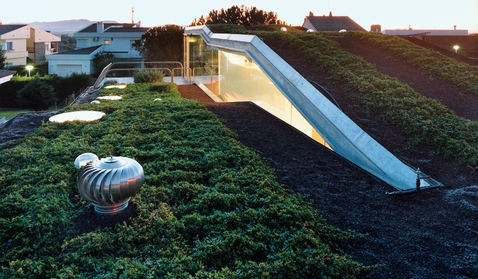 Some may say, "What's the good in a green roof?" or, "How is that practical when it comes to building a home? 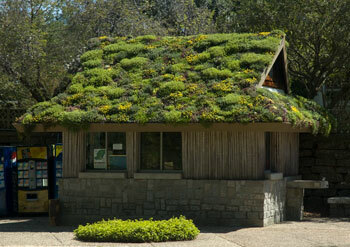 "A green roof is an interesting idea that may seem exotic to many. Not so! Anyone can have a green roof and it can do you a world of good. So why a green roof or wall? Reduces the temperature of the surrounding air, reducing the Urban Heat Island effect (I’m planning to go into a bit more detail about this in a few days, but suffice to say that cities are often hotter than the surrounding rural areas because of the building materials, lack of green space, and density). Reduces storm water runoff. Sewers backing up around you after a few days of rain? The ones on my street are. If your roof was absorbing it’s share of that water instead of redirecting it down the drain spout and into the sewer, there’s a significantly lower chance for overflow and backing-up. You can breathe easier with a green roof around because plants = oxygen. Urban gardening is a way to bring the farmer out of any city dweller. You can read more about that at this Low Impact Man post. To learn more about green design, LEED credits, green products and project case studies, please visit the building green website. La Selva is not just another gated community with a resort-like atmosphere, we are a green project and we are encouraging our residents to practice green too, whether residing in La Selva or not. Copyright 2008 LaSelvaRoatan. All rights reserved.